1. Your website looks old and outdated. Your website is your first impression for customers finding you online. The quality of your website is a direct reflection of your business image. If your customers are turned off by your website, you may be losing them before you have the chance to explain all of the wonderful things you have to offer. While your website may have been top of the line when it was designed, many years later that look may be outdated. With a few updates, your website will be fresh and modern again. 2. Parts of your website are not working. Over time, website technologies and features can become outdated. Flash, for example, was a very popular web design tool used to created animations and really cool website effects many years ago. With the rise of mobile users, Flash became obsolete and replaced by HTML5. Keeping up with changes in technology is an important reason to redesign your website. As a small business owner, it is important to spend a little time evaluating your website every few years to ensure it is keeping up with the current technologies. 3. You want to be able to make updates yourself. As a small business, keeping your expenses low is sometimes a necessity. If you have the time and interest in updating your own website, you can make these updates without hiring a webmaster. WordPress is the most popular content management system (CMS) available today. The easy to understand interface means that you don’t need to learn code in order to make basic updates to your website. Because of its popularity, there are tons of resources – blog articles and video tutorials – available to help you learn how to manage your website. 4. You are not getting the results you want from your website. Just having a website doesn’t mean you are going to receive a constant flow of leads. It requires marketing work to promote your website to get traffic to your pages. 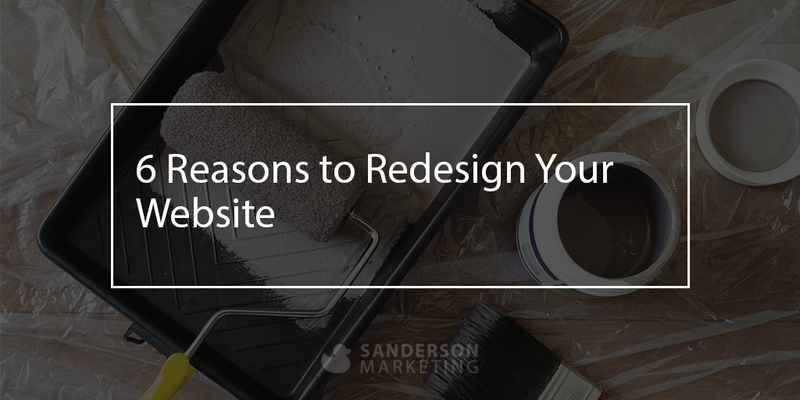 If you are working hard to promote your website and getting visitors, but you aren’t seeing the results you expected, it could be time to redesign your website. Studying the analytics of your current website can help you understand where you are losing visitors. With this information, you can redesign your website with a clear idea of your goals and customer behaviors. 5. You have rebranded and your website no longer matches your other marketing. Rebranding yourself over time is a great way to keep your business fresh, modern and relevant. When you update your logo or change the style of your business cards, it’s important to keep that look consistent across all of your marketing. Your website should match your company branding so visitors are getting a consistent message whether they see you in person or online. 6. Your website is not responsive. A responsive website means that your web pages are designed for optimal viewing experience on any device size. It has become increasingly important to have a website that adjusts for mobile viewers, not only for the growing number of users that surf websites on their phones, but the search engines are now using this as a factor in search engine placement. If your current website is not responsive, you could be losing visitors and your placement in the search engines. This factor alone, is a great reason to redesign your website. Interested in redesigning your website? It’s time to get more out of your website. I offer affordable plans for small businesses and entrepreneurs looking to redesign their website. Contact me for a quote.